Warren Vale Colliery, Rawmarsh, Rotherham. Their disasters are worthy of a mention in your website. I can only find one at the moment but I think there was another more minor one. My ancestors were miners there and lived in cottages nearby but managed to escape without loss of life. In the mid 1970s a local Mines Rescue Man, Dennis Concannon of Rawmarsh, was killed down Silverwood pit, which is Rotherham. He was our neighbour and friend for many years. We are no longer in touch with his family, his parents are deceased I believe, but I have been unable to locate anything about this accident, how it happened etc. There are some local newspaper articles on fiche in the local museum which I can trawl through, but I wondered if you had any other suggestions for searches? From outward appearance, everything went on as usual until a few minutes before 7 o'clock. At that time, not only those near the pit, but the whole neighbourhood, were astounded and horrified by an explosion like that of a volcano. Smoke and flames burst from the mouth of the pit in an appalling volume. Two corves which were being drawn out of the pit were projected upwards with volcanic force, and lodged in the gearing over the shaft. A great quantity of coals, stones, and other matter, which had been carried high into the air, fell in a dense shower and the persons employed near the pit mouth were compelled to take shelter under the platform of the tipplers for loading the carts; it was only by this precaution, that they escaped possible fatal injury. 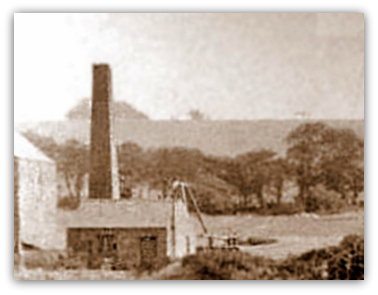 The colliery was owned by Messrs. Charlesworth and had only been worked about 12 months. The explosion claimed the lives of fifty two men and boys. The colliery had two shafts that were a few yards apart. The downcast was twelve yards in diameter and 127 yards deep to the Nine Feet Coal and the upcast was nine feet in diameter and 65 yards deep to the Five Feet Coal. The down cast shaft took air to both the mines and there was furnace, nine feet long and seven feet wide at the bottom of the upcast shaft which carried the air from both the mines. The air was split at the bottom of the downcast and sent to the Five Feet Coal and then on to the deeper thick coal mine. From here it returned through a staple pit that was only six feet in diameter. In the mines, single ventilation doors were fixed where double ones should have been. Brattices were used in some of the bordgates and even during the day there was not a permanent furnaceman. At night the furnace was not attended at all. The mine was lit with candles. The colliery was comparatively new and there had been about two acres of coal worked and the thick coal, in which the explosion occurred, had not been driven more than three hundred yards in any direction and the goaves were limited. On the west side, where the gas fired there were three banks numbered 1, 2 and 3. They varied from thirty to forty yards in width and the roads into them were supported by pack walls, six feet thick that had been built from the material that had fallen from the roof. Seventy men and boys worked in the lower coal and they were supervised by a steward who was old, infirm and had very little knowledge, all factors that worked against him doing his job efficiently. He had a ‘fire trier’ who was labourer to help him in the morning but generally the men went down the pit in a morning without any report from him. John Roebuck was the engine tenter at the colliery and went to work at 5 a.m. on the morning of the disaster. The men started to arrive at the colliery about an hour later and it was at this time that the ‘fire trier’, Thomas Sylvester arrived and he was let down the pit first. He did not take a lamp but had a piece of lighted tar rope. The mine was not worked with lamps but considered safe for naked lights. Four or five men went down with Sylvester. Roebuck stated that he had never been told not to let men down until Sylvester had inspected the mine and said it was safe. The practice at the colliery was for the men to go down after him. Roebuck was in the engine house when the explosion occurred at about five minutes to seven. Two corves of coal were in the deep shaft about ten yards from the bottom. Charles Burgin worked in the pit as a packer and started work at 6.20 a.m. on the bank at the dip side. he had been there half an hour when the disaster happened. Mr. Burgin went down the pit again and gave an account of the operations that went on to recover and inspect the mine and to recover the bodies. “We then got some tarpaulin sheets and nailed them in place of the trapdoors and stoppings, which were all blown down. We continued on the level where we found six bodies. We then went to the No.3, or far most bank, and found Thomas Knapton, Henry Gothard, Joshua Bugg, Charles Sylvester and Benjamin Lane. The search was continued by other parties and the last man who was Thomas Sylvester was brought out of the pit about 8 p.m. All the doors in the pit had been blown out and repair work was put into operation.